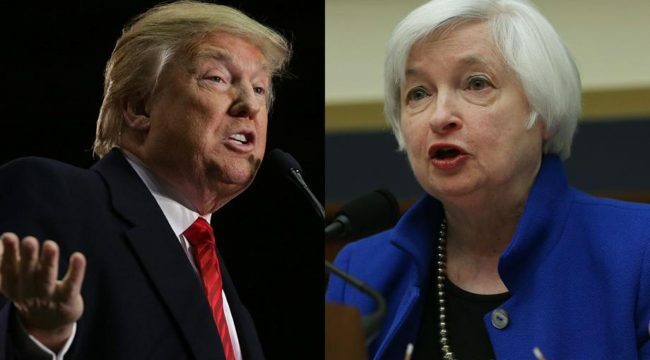 Trump Must Fire Janet Yellen — First Thing! The Keynesian statists at the Fed think the devastating financial busts we’ve suffered since 1987 were due to a mix of too much investor exuberance, too much deregulation, a one-time housing mania and a smattering of Wall Street greed and corruption, too. And that’s not to overlook some of the more far-fetched reasons for the two big financial meltdowns of this century. Foremost among these is the Greenspan-Bernanke fairy tale that Chinese workers making under $1 per hour were saving too much money, thereby causing low global mortgage rates and a runaway housing boom in America! Needless to say, not only are these rationalizations completely bogus; but so is the entire underlying rationale for Keynesian monetary central planning. The claim that market capitalism is chronically and destructively unstable and that the business cycle needs constant management and stimulus by the state and its central banking branch is belied by the historical facts. Every economic setback of modern times, including the foundation events of the Great Depression — was caused by the state. The catalyst was either inflationary war finance or central bank fueled credit expansion, not the deficiencies or inherent instabilities’ of market capitalism. Nevertheless, the Fed’s model robs the millions of workers, entrepreneurs, investors and savers who comprise the ground level economy and the billions of supply-side prices for labor and capital through which they interact and ultimately generate output, income and wealth. Instead, the Fed focuses on the macroeconomic aggregates as the key to achieving its so-called dual mandate of stable prices and maximum employment. Essentially, the United States is held to be a closed economy resembling a giant bathtub. In the pursuit of “full employment,” the central bank’s job is to keep it pumped full to the brim with “aggregate demand.” But the domestic macroeconomic aggregates of employment and inflation cannot be measured on an accurate and timely basis. Now, these Keynesian aggregate demand management tools did appear to work for several decades prior to the arrival of Peak Debt. But that was a one-time monetary parlor trick. Households and other economic actors were repeatedly induced to “lever up” via periodic cycles of cheap-money stimulus, thereby supplementing consumption spending derived from current incomes with the proceeds of incremental borrowings. That did goose “aggregate demand” but only on a temporary and artificial basis. That is, ever-rising household leverage ratios simply borrowed economic activity from the future; they did not generate new, sustainable wealth. And now monetary stimulus doesn’t work anyway because household balance sheets are fully leveraged. Under the historical and sound economics of Say’s law, supply creates its own demand. Production comes first. Aggregate demand is not independent; it is a derivative of production and income. It is what households and businesses choose to spend, rather than save, from current income and cash flow. Prior to the confusions introduced by John Maynard Keynes, most economists understood the common sense proposition that production comes first. In an honest and stable economy, it still does. Accordingly, true “aggregate demand” never needs any help from the state and most especially its central banking branch. That is, the true source of increased aggregate demand is more labor hours and improved productivity, increased entrepreneurial effort and managerial efficiency, greater savings and investment and more technological innovation and invention. By contrast, today’s central bankers who lean toward the Keynesian texts are statists. They claim to know that the actual level of “aggregate demand” derived from current production and savings is incorrect and chronically deficient. Say’s law of supply is thus superseded by the supposedly greater wisdom of central bankers. Having divined the correct level of “aggregate demand,” in fact, the central bank is then charged with making up the shortfall. This spending increase is accomplished by cutting interest rates or monetizing the public debt to order to foster increased borrowing, thereby supplementing spending derived from current production with the incremental proceeds of expanded credit. At length, according to the Keynesian texts, the nation’s economic bathtub becomes filled to the brim with just the right amount of “aggregate demand.” Accordingly, labor is fully employed, industry operates at 100% of capacity, government coffers bulge with “full-employment” revenues and unicorns prance around happily throughout the land. Here’s the thing. The whole bathtub model of “potential GDP” and the associated state of “full employment” is a crock. It consists of a bunch of made-up roundhouse benchmarks that are absolutely meaningless in today’s global, fluid and technologically dynamic economy. This also means that the theoretical “aggregate demand” that is the target of Fed policy is an illusion, too. Unlike true aggregate demand derived from actual current production and income, the Keynesian central bankers’ version is merely inferred from crude guesses about the theoretical production and employment capacity of the domestic economy. In fact, these “potential GDP” and “full employment” benchmarks are not scientific in the least; they are little more than the econometric scribblings of Keynesian academics. The results are so silly, primitive, constantly changing and logically superficial as to beg a basic question: if massive financialization and cheap money were not so convenient for Wall Street and Washington alike, would real adults actually take our Keynesian central bankers seriously? I think not. Bubble Finance liquidity for Wall Street and endless monetization of the public debt for Washington is the veil of convenience that enables our monetary central planners to operate virtually without restriction. Accordingly, the Federal Reserve soldiers on in a constant state of heavy-duty intrusion in the financial markets, including the lunacy of what is now 93 months of ZIRP. The denizens of the Eccles Building are like the crazy man in the bus station waving his arms in a circular motion to ward off an elephant attack. In a similar manner, the FOMC fiddles with fractional changes in the money market rate under the delusion that it is making up the aggregate demand shortfall and thereby closing the gap between actual and potential GDP. Well, let’s see. Everyone knows this is a service economy. So how do you measure the potential output of a Pilates studio and whether its instructors, equipment and facilities are fully employed? Should that computation be based on five or seven days a week and one, two or three eight-hour shifts of instruction per day — or something else? And what are the units of output — solos, duets and group sessions of one hour or more or less? How about black car limo fleets and drivers? Now that Uber has arrived in so many cities with digitally dispatched service on demand, vehicle fleets do not spend half of their time sitting around waiting for clients anymore. Huge latent fleet capacity has thus been liberated by technology in this instance, and in too many like and similar circumstances to even recount. For instance, what is hotel room capacity in a world of Airbnb? That is to say, “capacity utilization” is an utterly fluid and dynamically changing condition that cannot be even remotely fathomed in a globally traded, technologically dynamic, and service-focused modern economy. The whole idea of measuring potential output is a stupid throwback to the 1950s, when freshly minted Keynesian PhDs were looking for an excuse to practice their math skills. The claim of business-cycle failure and the need for relentless monetary-policy interventions in the financial markets designed to smooth and optimize it is a self-serving invention of central bankers and Keynesian economists. So the business-cycle-failure story is complete nonsense. Cutting to the chase, the Humphrey-Hawkins Full Employment Act is one of the stupidest, most dangerous and anti-democratic laws ever enacted. It amounts to a complete delegation of power to a tiny unelected and unaccountable posse of monetary bureaucrats. It must end.